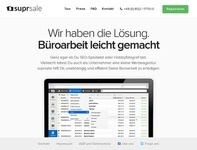 suprsale is a SaaS-office software for writing quotes and invoices that can be sent automatically via fax, mail and e-mail. In addition, the client manages effortlessly its customers and products. Ideal for entrepreneurs and small businesses. The compensation is done for each new and active customers, which is testing the product within the 30 days period for free. No cash back, no incentive.